Despite progress made since the Zika and Ebola crises, most countries are not adequately prepared for a pandemic and are still investing too little to strengthen preparedness. A report by the International Working Group on Financing Preparedness (IWG), established by the World Bank, finds that the investment case for financing pandemic preparedness is compelling. In low- and middle-income countries that have calculated the cost of financing preparedness, the investment required is just $1 per person per year, the IWG says. Meanwhile, a severe pandemic could result in millions of deaths and cost trillions of dollars, while even smaller outbreaks can cost thousands of lives and immense economic damage. The report lays out 12 recommendations to ensure the adequate financing of the capabilities and infrastructure required to prevent, identify, contain, and respond to infectious disease outbreaks. 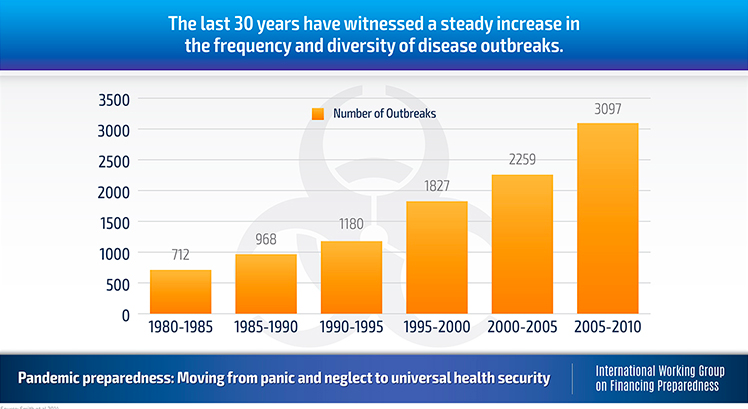 Many countries chronically underinvest in critical public health functions like disease surveillance, diagnostic laboratories, and emergency operations centers, which enable the early identification and containment of outbreaks, according to the IWG.